In February 2017 the Trump administration rescinded the guidance to schools put in place by the Obama administration in 2016 regarding trans student access to bathrooms and locker rooms matching their/her/his gender identity. A key point to know is that THE LAW HAS NOT CHANGED. Trans students still have the same rights under Title IX as before. What HAS changed is the current federal administration announced it will not ENFORCE the law and assigned each state to determine how/when/if to enforce Title lX protection. With 13 states already having passed or considering “bathroom laws” this means trans students and adults face confusing and differing rights depending on the state they live in, move to, or travel to/through. In California we have our own state law prohibiting trans discrimination in schools. THAT hasn't changed, and current state leadership vows to maintain these laws and protections for our trans students. We as the Transfamily Support Group of Santa Cruz County can also offer help and other resources since many of our members have been instrumental in guiding local schools to support their children as trans students. Civil rights advocates including the Transfamily Support Group of Santa Cruz County are fighting to ensure that the rights of vulnerable trans children and adults are grown and legally protected at the federal level, so that these rights are consistent throughout the United States. It must be noted that intersex and non-binary children and adults facing these same issues need to be included in the current national conversation and advocacy. Public education to expand social awareness needs to be stepped up to combat the misinformation and lies that are at the core of expanding anti-trans legislation. Some elected officials are trying to lead us backwards, but not all is lost. There is still much that can be done and is being done to ensure protection for trans children facing discrimination at school anywhere in the United States. 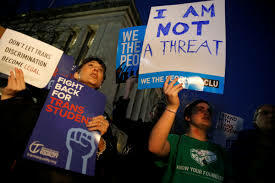 Legal help and guidance continue to be provided by many strong, allied, national organizations including but not limited to the American Civil Liberties Union (ACLU), National Center for Transgender Equality (NCTE), National Center for Lesbian Rights (NCLR), Human Rights Campaign (HRC) and Transgender Law Center (TLC) located right here in Oakland. The Transfamily Support Group of Santa Cruz County encourages our community to follow and donate to these groups.